If high drama is what you were looking for in the new Club Championships format, the prequarters had plenty to offer. With both GOAT and Doublewide getting upset in pool play and facing an early morning game on Friday, the stage was set for a top-four seed to exit the tournament before quarterfinals, an event that has only happened at the Club Championships once since 2004. Meanwhile, many teams with similar performances on Thursday were set to test their grit on the field against each other. Teams like PoNY and Machine, and Chain Lightning and Truck Stop were all fighting for their tournament lives against teams of similar caliber. Lastly, you had the dominant teams of Thursday — Revolver, Ironside, Johnny Bravo, and Sockeye — all playing against a team with its back against the wall for the first time of the weekend. Would GOAT or Doublewide go home? Who would advance from the middle of the pack? Could a four-seed beat all odds and advance to the next round? Those big questions would all be answered by the time the dust settled. GOAT had a surprisingly poor performance on Thursday that lead to this deadly prequarters matchup coming far earlier in bracket play than most anticipated. From the get-go in this game, both teams knew that they needed to truly battle if they had any hope of getting through to the next round. 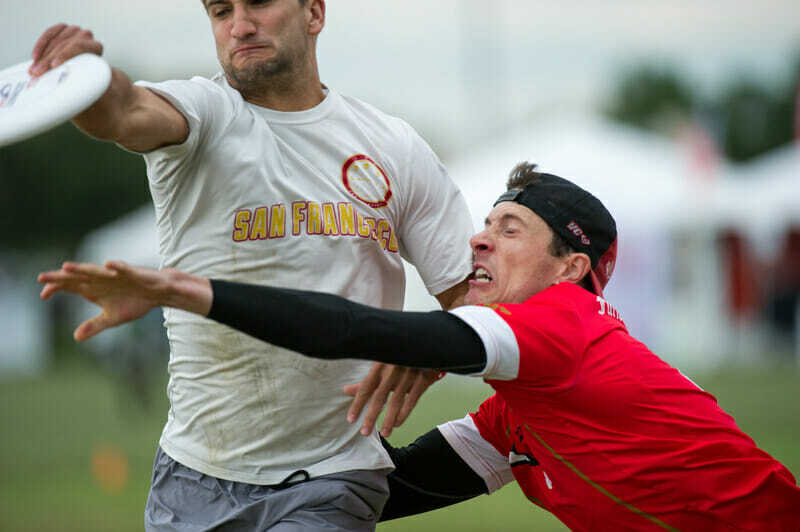 Doublewide put a lot of pressure on GOAT’s offense, the same offense that had been a buzzsaw at Regionals and the Pro Flight Finale, and forced multiple turns early in the game. The big story throughout the beginning of the game was Doublewide’s star, Kurt Gibson, who caught or threw every single one of Doublewide’s five breaks in the first half of the game to lead his team to a 8-3 halftime lead. If Gibson’s dominant performance didn’t surprise viewers, what may have done the trick was the fact that Doublewide, a team that looked supremely in control for most the game, slowly let GOAT chip its way back into the game. Doublewide looked to have the game well in hand at 11-6 but GOAT captain Mark Lloyd, who went down with an injury late in the game, watched his team get back to within two at 13-11. It was more than mentality to Loskorn; GOAT changed the tone of the whole game. Doublewide would eventually score the point at 13-11 to win in the soft cap, 14-11. As the teams walked off the field, one was left wondering just what could have been if the GOAT team that appeared from 11-6 to 13-11 had been present for the entire tournament. Lloyd harped on the youth of his team and that their season was not over as they still could earn a berth in the Pro Flight, and he attributed GOAT’s downfall to some of that youth and inexperience. “Maybe the stage was a little too big for us,” Lloyd said. Once bracket play started, there were eyes on two specific games, Machine vs. PoNY and Chain Lightning vs. Truck Stop. These were four teams seeded more or less in the same area of the tournament, all with similar results, all fighting to advance to quarterfinals, and both match ups featured teams that were playing each other for the first time in 2013. Though the round would be interrupted by an hour-long lightning delay, the intensity of these games would not be affected. Small runs occurred here and there but no team asserted itself in either match up as the favorite to win at any point. For Machine and PoNY, both teams focused on their own goals and accomplishing them as best they could. Machine did that by funneling the disc to Jonathan “Goose” Helton and allowing him to work all over the field. Helton bombed two 50+ yard hucks to receivers throughout the game and reeled in plenty of scores of his own. However, though Machine was able to establish itself with a 10-7 lead, PoNY, true to what captains Milo Snyder and David Vuckovich said before the game, continued to “play New York Ultimate.” Though that is a vague statement, Snyder and Vuckovich quantified it as “grinding” and representing their “Rats” jerseys. That grinding earned PoNY an 11-11 tie late and, after forcing another turnover at 11-11, captain Jack Marsh got into a high stall situation near the goal line and put the disc up for grabs. Albert Alarcon went up over a crowd of Machine defenders and gave his team an 12-11 lead, their first of the second half. The lead wouldn’t last long as Machine tied the game at 12-12 and then put AJ Nelson on the field for its double-game point defensive stand. Nelson answered the call, getting a huge layout block past Robbie Gillies and followed that block up with a precise upline cut to catch the game winning bookends score. Just a few fields over, Chain Lightning and Truck Stop entered into a similar battle. Instead of a game of runs like PoNY vs. Machine, Chain and Truckstop traded point for point as the game wore on. At no point in the entire prequarters round did either team earn a lead of more than one with each team firing on all cylinders offensively. At halftime, Chain captain Mark Poole talked to his team about forcing Truck into its second and third options. As the game wore on, it was clear that both teams were not going to give way. Though Chain’s intensity was improving, Washington D.C. was matching point for point thanks in large part to Alan Kolick. Kolick was directing D.C.’s offense and making sure that regardless of Chain’s defense, D.C. put the disc in the endzone. Just to mention a small example, at 13-12 Chain, in a game to 14, Kolick made a full extension grab in the endzone to hold after a long point and force double-game point. However, after some hotly contested foul calls Chain would win double-game point by setting Nicky Spiva up isolated in the endzone and letting him leave his defender in the dust. For Truck captain Sean Keegan this was just a small example of how Truck’s season has gone all year. There isn’t much to say about the performance of Johnny Bravo, Revolver, Ironside and Sockeye had in the first round. Bravo and Revolver rolled to 15-6 victories over Furious George and Florida United respectively, with the outcome of each game never even remotely in doubt. While Ironside and Sockeye didn’t win as convincingly, they did take care of business quickly, which put them both in a better position for their quarterfinals games as both of their opponents (Chain and Machine, respectively) were coming off double-game point wins. Comments on "Prequarters Recap: Men’s Division"